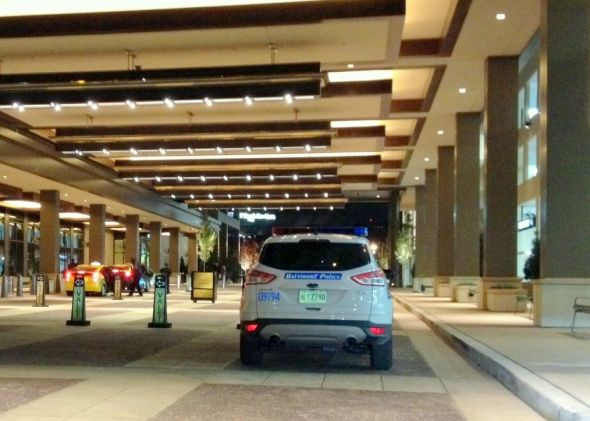 Above: Officers who watch over Horseshoe Casino (shown here at the valet parking plaza) are paid from community impact funds and police overtime. Spending on overtime by the Baltimore Police Department has dipped under a new union contract, but is still expected to reach a record high this year. Budget director Andrew Kleine told a City Council committee that BPD’s fiscal 2015 overtime is now projected at $33 million, down from the $38 million estimated in December. The latest figure is still $4 million above the $29 million spent by the department in 2014 – and $2 million over the previous high water mark of $31 million recorded under Mayor Martin O’Malley in 2006. Kleine attributed lower overtime costs to a new patrol schedule for officers rolled out in January. “Early returns from the implementation of the new schedule” have been favorable, Kleine said, but he warned that it is too early to tell whether the schedule will make a substantial dent in the agency’s habitual reliance on overtime. The city’s new contract with the Fraternal Order of Police calls for a 13% wage increase over three years in return for more flexible work schedules and staffing. “The contract was aimed at reducing the overtime budget – we hope,” Klein told the Council’s Budget and Appropriations Committee in a mid-year budget review on Tuesday. Kleine said overtime costs in the department are driven by retirements and high turnover, which results in chronic understaffing. In addition, the “targeted crime reduction initiatives” announced by Police Commissioner Anthony W. Batts have added to spending. Another factor escalating overtime is the “casino mini-district” that was established last summer to coincide with the opening of the Horseshoe Casino on Russell Street. The mini-district’s force of 18 officers and four supervisors is partially funded by $1.5 million in community impact grants coming from the casino, but also from overtime directly paid by the department. Police have not disclosed those costs. The city had budgeted $20.5 million in police overtime this year, which leaves a gap of over $12 million, according to Kleine. Some of those costs, however, will be paid by “funded vacancies.” This refers to a longtime practice by police (and other city agencies) to fund vacant positions that are not expected to be filled. Through this accounting device, a department can dip into monies that have been accumulating in the empty positions to offset overspending as the budget year comes to a close. Baltimore police have more than 200 funded vacancies, which will reduce their “net” overtime deficit to about $15.7 million this year, according to Kleine. To offset the overtime deficit that is not paid for by funded vacancies, the department relies on supplemental spending bills that are presented (and routinely passed) by the City Council throughout the year.